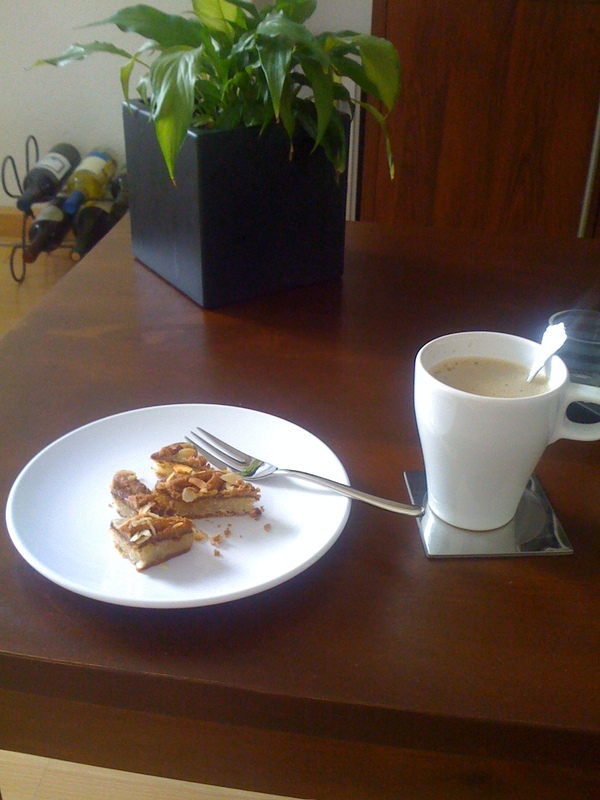 This is how I adjust, a nice cup of coffee and cake! I love the baked goods I can get in the store so much that I don’t really bother with baking. The first time I bought this cake I thought it was an individual piece and put the entire thing on my plate. Björn raised an eyebrow at it and asked erm are you planning to eat ALL of that? I said well yes unless you want a bite. He said noo you go ahead. Needless to say a few bites in and I knew this was not meant to be eaten by one person! Delicious and rich, a few bites is plenty. I am having a little trouble getting used to the cold. It was really hot when I left Dallas, so the wind and rain are a change. I also forgot Emma’s sweaters (along with her leash and harness) so she is not liking it either. I also did not notice that my laptop has a grounded plug so does not work in a normal adapter, which I also forgot. Poor Björn had to drive to Zeist Saturday and search all over, he found one and when he got it home we discovered the grounded plug. That leaves me with a 13 pound paperweight. The reason I came over so unorganized is that I waited until Friday morning to go get Emma’s papers. It was really my only chance since three people are sharing my car. Over a course of nearly 4 hours the vet argued with me over what I needed, I tried to tell her what they actually ask for at customs and she tried to tell me what some woman in Austin told her. I ended up just coming with what I had as she refused to give me anything, we will see if they get me back into the US or not. So overall things are going well and it is a bright, sunny day today! It is cold, there is no getting around that. I have learned massive amounts of coffee help alot:) I like some of the baked goods here..wich is your favorite?? I like those black and white cakes with creme inside, I call them Dutch Ding Dongs lol! Our freezer is so small, especially when Björn keeps it half full of bread! Hi, Juli! Just found your blog following the link to a comment you left on Lizzy's blog (Lizzy Goes Dutch). Is it a lot of paperwork you need to do to take your pet back and forth?Welcome back to the Netherlands, enjoy…. the coffee and cake!! Cheers! We have a passport for our cat, it says everything that we need to travel with her… We don't….If all three of us travel somewhere out of Holland, she stays with Marcel's parents, but we can take here wherever we want to… It came with her chip.. I guess maybe they don't do that in the US? All I really need is the information about her chip and her Rabies Certificate but the certificate has to be signed within 4 months. That was all I needed that Biyatch to do was give me a new one and she argued that I needed all this other crap, I told her nooo, maybe you did like 10 years ago and now you only need a health certificate to go to the UK or other island countries which we are not.